This study attempts to identify the impact of the United Kingdom’s decision to withdraw from the European Union (EU) on the access of British non-governmental organisations (NGOs) to EU funding. Primary quantitative data was gathered from 43 managers and employees of four UK-based NGOs. 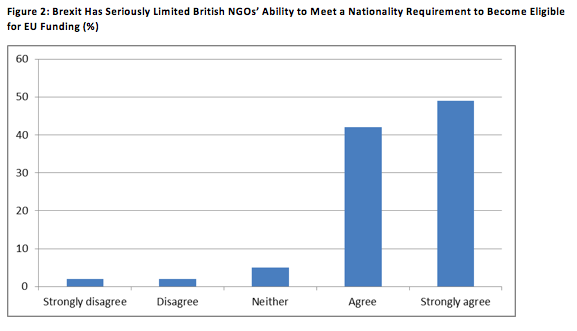 The analysis outcomes demonstrated that Brexit had considerably limited UK-based NGOs’ ability to meet the nationality requirement as well as their access to funding from the European Union. The main limitation of this project refers to the small size of the sample. The researchers who investigate the consequences of Brexit for the UK’s economic and social context could be interested in this dissertation. Although the UK’s withdrawal from the European Union (EU) is expected to have a positive impact on the country’s economy in a long-term perspective, this decision is also associated with a range of negative consequences. The limited access of British non-governmental organisations (NGOs) to EU funding is one of these concerns (Gordon, 2016). At the same time, there is still a lack of empirical evidence on how Brexit has affected the access of humanitarian organisations that are registered and have their centre of decision-making in the United Kingdom to EU funding. This dissertation attempts to narrow this gap by exploring the impact of Brexit on the access of UK-based NGOs to EU funding. In 2016, as a response to growing public concern about both social and economic issues, the majority of the participating UK electorate decided to leave the EU (Adler-Nissen et al., 2017). The UK’s decision to withdraw from the European Union is mostly explained by large-scale immigration into the country, the recent fall in British workers’ real wages, the country’s limited ability to participate in the appointment of the European Central Bank’s management body, the British government’s inability to influence the key decisions related to its integration with the EU and budgetary issues (Clarke et al., 2017). NGOs are non-profit organisations, meaning their ability to reduce global poverty and ensure sustainable economic, environmental and social development depends heavily on government and private funding (Fahy et al., 2017; Wintour, 2016). To identify the main causes of Brexit. To examine the most important consequences of the UK’s withdrawal from the EU. To assess the effect of Brexit on British NGOs’ access to EU funding. To provide UK-based NGOs with practical recommendations as how to fund their activities more effectively. This dissertation consists of the Introduction, Literature Review, Research Methodology, Analysis and Findings and Conclusion. The first chapter provides the reader with the research background and formulates the main aim and objectives. The next chapter is responsible for reviewing the most relevant literature on Brexit, its causes and consequences as well as its effect on British NGOs’ access to EU funding. The most suitable research methods and analysis tools are selected and justified in the third chapter. The fourth chapter presents and interprets the analysis findings. Finally, the last chapter compares and contrasts the produced outcomes with previous researchers’ findings and provides a set of practical recommendations. According to the existing body of literature, there are several social and economic causes for the UK’s decision to withdraw from the EU (Wincott et al., 2017; Owen, 2017). Immigration can be attributed to both economic and social factors that affected the UK’s decision to leave the European Union. Despite the fact that the share of Britain’s population comprising non-Britons is comparable to other European countries, immigrants were considered to put the UK’s education services and the National Health Service (NHS) under pressure (Tilford, 2016). In addition, Owen (2017) noted that immigration caused the recent fall in British workers’ real wages. According to the EU’s immigration policy, EU nationals can freely migrate across the state members and work in any European country they want (European Commission, 2017a; European Commission, 2017b). As a member of the EU, the UK’s ability to influence immigration from the European Economic Area was significantly limited. As a result, immigrants posed a serious threat to British workers’ wages. At the same time, the falling wages in the UK can also be explained by a deep recession caused by the world financial crisis of 2008 (Tilford, 2016). The UK’s limited ability to participate in the appointment of the management body of the European Central Bank can be viewed as an economic reason for the country’s withdrawal from the EU (Henderson et al., 2016). The United Kingdom had no say in euro zone matters, which made it relatively isolated in the European Union. As a result, the UK was unable to influence the key decisions related to its integration with the EU (Clarke et al., 2017). This factor posed a certain threat to Britain’s economic stability. The most recent financial recession also added to this threat and encouraged the government to conduct the advisory referendum on the UK’s EU membership (Parker, 2017). It should be noted, however, that Britain has not signed the recent economic governance strengthening documents such as the Fiscal Pact or the Single Resolution Mechanism (Rees, 2017). On the one hand, by signing these documents, the government could have further integrated the UK’s economy into the EU. On the other hand, London had managed to remain relatively independent from the EU’s economic influence (Thompson, 2017). Net budgetary issues can also be attributed to the economic factors that resulted in Brexit. The UK’s excessive net contribution to the budget of the European Union was caused by the fact that the country received too little sources from the EU and, at the same time, had to contribute too much to the member states (Gordon, 2016). One potential explanation of this disproportion is that the structure of the common budget of the EU was decided several years before Britain became a state member. As a result of this structure, the UK lost around £10 billion during the 2007-2013 period (Somai, 2016). The issue of sovereignty is also considered as one of the key reasons for the UK’s decision to withdraw from the EU. The European Union Act 2011 created a wide range of direct democratic ‘barriers’ to the UK’s ability to transfer its power and competence to the European Union (Adler-Nissen et al., 2017). This document also ‘blocked’ the ability of the UK Parliament to reaffirm that its sovereignty was retained during the country’s membership of the EU (Simionescu, 2017). Although the majority of the UK’s population voted in favour of its withdrawal from the European Union, this decision is associated with both positive and negative consequences for the country’s economy. For example, on the positive side of Brexit, the British government has managed to take control over immigration and limit the flow of immigrants into the country (Portes, 2016). At the same time, this decision has produced a negative impact on UK labour market developments. According to the most recent data, the net increase in employment was predominantly accounted for by non-Briton workers (Ebell and Warren, 2016). In addition, more than 3 million UK jobs were linked to the country’s trade with the EU (Portes, 2016). As a result of Brexit, around 3 million British citizens have lost their job or faced numerous migration and policy challenges working both inside and outside the UK. As previously noted, the UK has not signed a series of the most recent economic governance strengthening documents produced by the EU. Nevertheless, the level of the integration of Britain’s economy with the remaining EU state members was considerable (Armstrong, 2017). The withdrawal of the UK from the European Union has limited its access to European markets through various tariffs and non-tariff barriers (Cowburn, 2017). Although the EU market is becoming less important for the UK, it still purchases around 45% of Britain’s exports (MacShane, 2016). Therefore, the withdrawal of the UK from the EU can be viewed as a potential threat to the country’s economic sustainability and development in a long-term perspective. By establishing free trade partnerships with Eastern European and Asian countries, the UK is able to contribute to its Gross Domestic Product (GDP) and minimise the potential risk of its decision to leave the EU (Oliver, 2016). In accordance with MacShane (2016), the role of foreign direct investment (FDI) in a country’s economic development is considerable. The UK is very successful in attracting FDI due to the fact that it is an open economy and, hence, foreign investors can easily purchase British businesses (Fabbrini, 2017). In addition, the UK’s legal system and regulatory culture are of high quality, making it an attractive location to invest (Jungblut, 2017). At the same time, as noted by Bee (2017), Brexit poses a certain threat to foreign investment, particularly from the European Union, due to tightening restrictions on FDI. This is expected to increase the cost of FDI, which, in turn, would force multinational corporations and foreign investors to lower their investments in Britain (MacShane, 2016). Similar outcomes were demonstrated by Outhwaite (2017) who noted that the UK’s exit from the EU would negatively affect the number of jobs generated by FDI projects. Furthermore, Dhingra et al. (2017) forecasted a 22% fall in foreign direct investment in the United Kingdom over the next decade. Therefore, a decline in FDI is one of the most severe economic consequences of the UK’s decision to withdraw from the EU. Brexit has created certain trade barriers between the UK and the EU, which are expected to produce a strong negative impact on the country’s economy (EMI, 2017). This issue is also relevant to UK-based non-governmental organisations whose activities are funded by the European Union. The main challenge for UK-based NGOs arises from the fact that they have to meet a nationality requirement in order to become eligible for EU funding (Jungblut, 2017). However, the UK’s withdrawal from the European Union has made the NGOs having their effective establishment in this county ineligible for EU funding since now they are treated as foreign non-governmental organisations (Fahy et al., 2017). In addition, these entities might have their existing grant agreements terminated by the European Commission, which would lead to losing the benefit of expected funds from the EU (Larsen and Brockington, 2017). Thus, Brexit is considered to affect UK-based NGOs both politically and financially. The UK’s withdrawal can also be viewed as its attempt to go against the most recent globalisation and internationalisation trend. Due to this trend, NGOs have managed to establish partnership relationships across countries and share humanitarian and development agendas (Owen and Ludlow, 2017). In accordance with Edwards (2017), UK-based NGOs could miss out on around £125million of funding on a yearly basis because of Brexit. At the same time, European NGOs would also suffer from Brexit since the UK has been an active member state contributor to European humanitarian budgets. For example, the Department for International Development (DFID) funded around 20% of the annual budget of ECHO, a European NGO, of which the main purpose is to reduce hunger (ECHO, 2017). Given that NGOs are non-profit entities, their ability to reduce global poverty, ensure sustainable economic, environmental and social development and promote the respect of human rights, democracy and good governance depends heavily on government and private funding (Fabbrini, 2017). The UK’s exit from the EU is associated with certain risks jeopardising the progress made by local NGOs in tackling with the previously mentioned social and financial issues. In addition, Brexit as well as the most recent economic downturn has negatively affected individuals and businesses in the UK (MacShane, 2016). As a result, they are less inclined to donate to NGOs. Finally, the depreciation of the national currency has limited the amount of work that non-governmental organisations can perform with the funding they receive (Welfens, 2017; Parker, 2016). That is why UK-based NGOs should work towards practical solutions for this issue, in order to survive and ensure their effectiveness in a long-term perspective (Bullock, 2017). For example, by establishing partnerships with European civil society organisations, British NGOs could get access to EU funding and strengthen their roles in both democratic processes and global development (Larsen and Brockington, 2017). This project is in keeping with the epistemological philosophical stance, which is concerned with the nature and acceptability of knowledge (Chawla and Sodhi, 2011). This choice is justified by the fact that only by getting access to reliable and credible data is the researcher capable of assessing the impact of Brexit on the access of UK-based NGOs to EU funding in an accurate manner. In addition, this dissertation incorporates certain elements from ontology since the researcher’s assumptions about reality affect the validity of the knowledge produced in the course of research (Novikov and Novikov, 2013). This study is in line with objectivism, a position than implies that social entities exist independently of social actors (Howell, 2012). Indeed, the researcher has no impact on NGOs’ business activities as well as their funding from the European Union. The researcher attempts to conduct this project in a value-free manner to eliminate all potential bias. Nevertheless, Singh and Nath (2010) argued that social phenomena were created from social actors’ perceptions and consequent actions. Given that this study explicitly involves theory, it is in keeping with the deductive approach, which implies following from theoretical assumptions to testing theory in practice (Creswell and Creswell, 2017). This approach has been selected since it allows for explaining causal relationships between variables (Saunders et al., 2015). Since this project is focused on the establishment of the relationship between Brexit and British NGOs’ access to EU funding, this choice is reasonable. As noted by Daniel and Sam (2011), deductive studies tend to collect quantitative data to test hypotheses, which is another reason for adopting this approach. At the same time, one of the main criticisms of deductive projects is that they limit methodology flexibility and do not allow for producing novel and unique findings (Clough and Nutbrown, 2012). The survey strategy, which implies collecting primary data from a sizeable population of individuals, has been selected for this project. As noted by Kumar (2014), this strategy is associated with two major data collection techniques, namely questionnaires and interviews. Self-administered questionnaires have been prioritised over interviews due to several reasons. 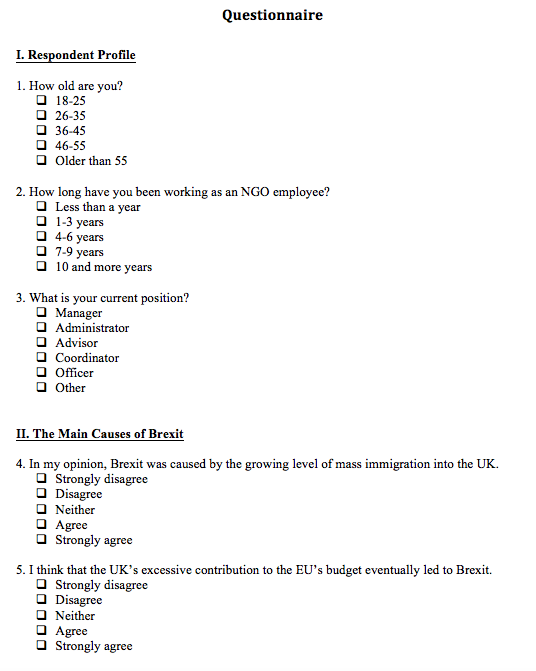 Firstly, alternatively to interviews, self-administered questionnaires allow for drawing a relatively large sample in a short period of time (Patton, 2014). Secondly, the data gathered with the help of self-administered questionnaires is quantitative in nature, making it suitable for graphical and statistical analysis (Bryman and Bell, 2010). Finally, self-administered questionnaires are considered to be among the cheapest techniques of data collection, which is another reason for the researcher’s decision to use them as the principal source of primary data (Gray, 2017). At the same time, the use of self-administered questionnaires is associated with several limitations that should be considered in this section. For example, as noted by Creswell and Creswell (2017), the range of the data gathered by means of questionnaires is relatively narrow as they provide respondents with determined, short answer variants. The extent to which the data collected by means of self-administered questionnaires is reliable and unbiased is also questionable. In accordance with Bryman and Cramar (2011), the response variants may not necessarily reflect participants’ actual opinions and attitudes. In addition, the lack of face-to-face contact between the researcher and the respondent during the data collection process does not allow for ensuring that the questionnaire is completed by the members of the targeted population (Merriam, 2015). The questionnaire sample employed to gather primary data for the purpose of this dissertation can be found in Appendix A. Since this dissertation attempts to explore the impact of Brexit on the access of UK-based NGOs to EU funding, it was decided to approach managers and employees of these organisations as the target population. Speaking more precisely, managers, administrators, advisors, coordinators and officers of British NGOs such as Oxfam GB, HelpAge International, Save the Children and Citizens UK were contacted and asked to participate in this project. Out of more than 60 questionnaires initially distributed among the target population members, 49 questionnaires were returned to the researcher. In turn, only 43 questionnaires were included in the final sample due to missing values. All respondents were accessed through the NGOs’ websites and Facebook accounts. The collected data was processed graphically and statistically to identify the effect of Brexit on the access of British NGOs to EU funding. The graphical analysis of the gathered data was conducted with the help of Excel, while all statistical calculations were performed in the IBM SPSS software. The variables used in the analysis are defined and presented by means of the following table. Based on the Literature Review chapter, the testable hypotheses can be formulated as follows. H0: Brexit has not produced any impact on British NGOs’ access to EU funding. H1: Brexit has considerably limited UK-based NGOs’ ability to meet the nationality requirement. H2: Brexit has produced a strong negative effect on British NGOs’ access to funding from the EU. The Analysis and Findings chapter begins with an analysis of the background data collected from 43 managers and employees of four UK-based non-governmental organisations. A total of 81% of the respondents asserted they were either between 26 and 35 years or belonged to the 36-45 age group. 12% of those surveyed reported they were between 46 and 55 years. Finally, the individuals who indicated they were either between 18 and 25 years or older than 55 years accounted for 5% and 2% of the sample, respectively. In total, 77% of the individuals reported their working experience as an NGO employee ranged from 1 to 6 years. As much as 12% of the respondents indicated they had been working for their NGO for 7-9 years. The participants whose working experience as an NGO employee was less than a year accounted for 9% of the sample. The remaining 2% of the individuals reported their working experience was 10 and more years. Administrators and coordinators accounted for 20% and 23% of the sample, respectively. In turn, 19% of the respondents reported they were officers in their NGO. 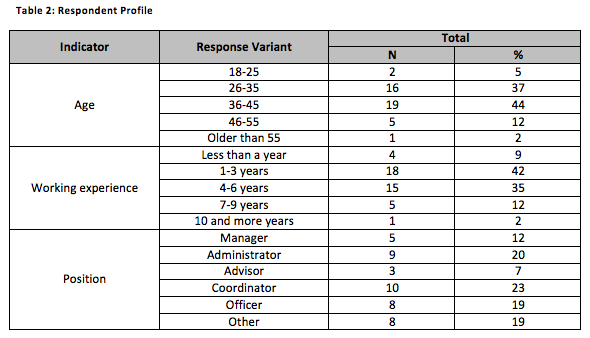 The participants who held a managerial position accounted for 12% of the sample. Only 7% of those surveyed indicated they were advisors. The remaining 19% of the individuals selected the ‘Other’ response variant. These findings demonstrate that the sample is drawn from highly experienced individuals whose knowledge about their NGO’s funding should be considerable. The descriptive statistics function in the IBM SPSS software was performed to identify the main reasons for the UK’s decision to withdraw from the European Union. The Mean of the IMI variable is the highest in the variable set and is equal to 4.33. Given that the Standard Deviation is close to 1, it is relevant to state that the given responses are not far from the Mean. Hence, the overwhelming majority of those who returned their questionnaire ether agreed or strongly agreed the growing level of mass immigration into the UK resulted in its withdrawal from the EU. These findings are in keeping with Tilford (2016) who also arrived at the conclusion that immigration into the UK, which posed a serious threat to British workers’ real wages as well as the country’s education and healthcare services, contributed to the government’s decision to exit the European Union. The Mean of the PAR variable is 4.05 and its Standard Deviation is slightly lower than 1. 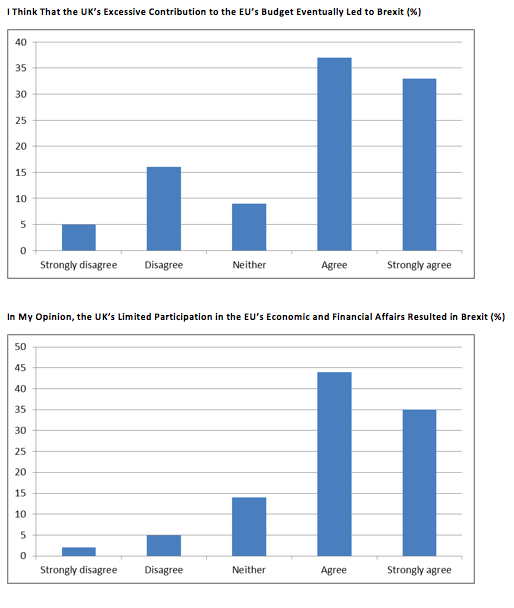 Hence, the UK’s limited participation in the EU’s economic and financial affairs was perceived by the majority for the respondents as the second-most important reason for the country’s decision to leave the European Union. In the same vein, Clarke et al. (2017) argued that the lack of the UK’s involvement in euro zone matters as well as its participation in the key integration decisions encouraged the government to initiate the Brexit vote. Finally, the United Kingdom’s excessive contribution to the EU’s budget was perceived as the least important factor that resulted in Brexit. This statement is made since the Mean of the BUD variable is equal to 3.78, which is the lowest among all the variables. As mentioned in the Literature Review chapter, Britain’s withdrawal from the EU is associated with both positive and negative social and economic consequences (Portes, 2016; Dhingra et al., 2017). The following table demonstrates the key consequences of Brexit from the perspective of the survey participants. The Mean of the ACC variable is equal to 4.47, which is the highest among the variables included in the descriptive statistics analysis model. The Standard Deviation of this variable is 0.70, which allows for stating that the participants’ responses are close to the Mean. Hence, the overwhelming majority of those surveyed either agreed or strongly agreed Brexit had seriously limited British organisations’ access to European markets. These outcomes are in line with Dhingra et al. (2017) who also reported that a 22% fall in FDI in the UK’s economy was expected over the next decade as a result of Brexit. At the same time, Fabbrini (2017) noted that the EU was not the only source of FDI in the economy of the United Kingdom. Further analysis indicates that the Mean of the CON variable is 4.37. Hence, the ability of the government to better control immigration and limit the flow of immigrant into the UK was perceived by the majority of the respondents as the second-most important consequence of Brexit. This control is expected to contribute to the UK’s economy by increasing British workers’ wages and reducing pressure on its healthcare and education services (Ebell and Warren, 2016). 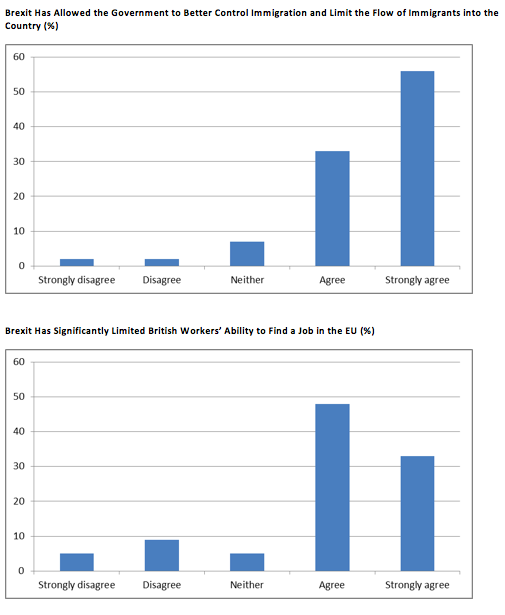 By contrast, Brexit was argued by Oliver (2016) to significantly limit British workers’ ability to get a job in the European Union. Although the Mean of the JOB variable is the lowest among the variables, Brexit’s negative impact on British workers’ employment in the EU was still assessed by the overwhelming majority of those surveyed as significant. The graphical representation of these findings can be found in Appendix B. The role of Brexit in British NGOs’ access to EU funding was examined with the help of the descriptive statistics function performed in the IBM SPSS software. The Mean of the FUN variable is the highest and equal to 4.51. The statistical findings also indicate that the Standard Deviation of this variable is not far from 1, indicating that the collected responses are close to the Mean. Hence, the respondents perceived Brexit to produce a strong negative effect on UK-based NOGs’ access to EU funding. The Mean of the REQ variable is 4.33 and its Standard Deviation is slightly lower than 1. These outcomes demonstrate that most participants either agreed or strongly agreed Britain’s withdrawal from the European Union had negatively influenced British NGOs’ ability to meet a nationality requirement to become eligible for EU funding. Finally, the Mean of the FDI variable is 3.44, which is the lowest in the variable set. Therefore, Brexit was perceived by the respondents to produce the least considerable impact on UK-based NGOs’ access to foreign direct investment. The results of the statistical analysis are strengthened by the graphical analysis findings, which are presented as follows. 35% of the respondents agreed Brexit had significantly limited British NGOs’ access to FDI from the European Union. 23% of those surveyed strongly agreed with this statement. 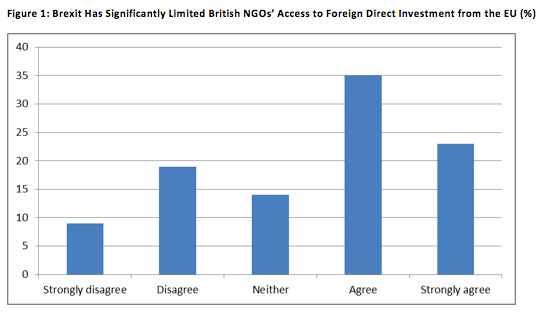 By contrast, the respondents who either disagreed or strongly disagreed Britain’s withdrawal had produced any significant impact on British NGOs’ access to foreign direct investment from the EU totalled 28% of the sample. The remaining 14% of the NGO employees gave neutral responses to this statement. In 2016, with a total of more than 1,100 FDI projects, the UK was Europe’s most attractive location for FDI (Simionescu, 2017). Nevertheless, Brexit is considered to negatively affect the attractiveness of the United Kingdom to global investors (Chapman, 2017). Hence, the produced analysis findings are in keeping with these forecasts. In total, the overwhelming majority of 91% of the individuals either agreed or strongly agreed Brexit had seriously limited the ability of British NGOs to meet a nationality requirement to become eligible for EU funding. At the same time, a total of only 4% of the sample either disagreed or strongly disagreed Brexit had a strong impact on UK-based NGOs’ ability to fulfil this requirement. The remaining 5% of the NGO employees were not so sure about their opinion and provided neutral responses. These findings are in line with Thompson (2017) who stated that the UK’s withdrawal from the EU had limited the access of those NGOs that were registered and had their centre of decision-making in the UK to EU funding. Nevertheless, as a response to Brexit, some British NGOs tend to establish a partnership with European humanitarian organisations in order to ‘bypass’ the previously discussed barriers and become eligible for EU funding (Bee, 2017). 60% of those who returned their questionnaire strongly agreed Brexit had negatively affected British NGOs’ access to funding from the European Union. 33% of the respondents also agreed with this statement. On the contrary, the individuals who either disagreed or strongly disagreed the impact of Brexit on UK-based NGOs’ access to EU funding was significant totalled only 2% of the sample. Finally, neutral responses were provided by the remaining 5% of the NGO employees. Thus, according to the analysis results, the UK’s withdrawal from the EU has posed a serious threat to British NGOs and their survival in a long-term perspective. The main aim of this dissertation was to explore the impact of Brexit on the access of British NGOs to EU funding. This purpose has been fulfilled by collecting primary quantitative data and analysing it graphically and statistically. The first research objective was to identify the main causes of Brexit. It can be concluded that large-scale immigration into the UK, its limited ability to participate in the appointment of the European Central Bank’s management body and the British government’s inability to influence the key decisions related to the country’s integration with the EU were perceived by the survey participants as the most important causes of Brexit. These outcomes are in keeping with Oliver (2016) and Thompson (2017) who also reported that the lack of the UK’s involvement in euro zone matters as well as its participation in the key integration decisions encouraged the government to initiate the Brexit vote. The second objective of this study was to explore the most important consequences of the UK’s withdrawal from the EU. Considering the outcomes from the Analysis and Findings chapter, it is relevant to conclude that Brexit has allowed the government to better control immigration as well as to limit the flow of immigrants into the country. At the same time, on the negative side, Brexit is considered to significantly limit UK-based organisations’ access to European markets and British workers’ ability to find a job in the European Union (Owen et al., 2017). This dissertation is in keeping with this statement as the majority of the survey participants reported limited employment opportunities and restricted access to the EU market as the key negative consequences of Brexit. The next research objective was to assess the effect of Brexit on British NGOs’ access to EU funding. As noted in the Literature Review chapter, Brexit has negatively affected the ability of UK-based non-governmental organisations to meet the nationality requirement to become eligible for EU funding (Outhwaite, 2017). The produced analysis outcomes have also demonstrated that the UK’s withdrawal from the EU is perceived to produce a strong negative impact on British NGOs’ access to funding from the European Union. At the same time, the impact of Brexit on FDI from the EU is perceived as less considerable compared to the previously discussed variable. Therefore, the Null Hypothesis, according to which Brexit has not produced any impact on British NGOs’ access to EU funding, has been rejected. In turn, Hypothesis 1, which implies that Brexit has considerably limited UK-based NGOs’ ability to meet the nationality requirement, has been confirmed. Finally, Hypothesis 2, which states that Brexit has produced a strong negative effect on British NGOs’ access to funding from the EU, has also been confirmed. The fourth objective of this dissertation was to provide UK-based NGOs with practical recommendations as how to properly fund their activities. Based on the analysis findings, it is recommended that British NGOs should create strategic partnerships with European humanitarian organisations to remain eligible for EU funding. This can be achieved by establishing a joint venture, which is registered and has it centre of decision-making in the EU (Ebell and Warren, 2016). It is also recommended that British NGOs should more actively attract foreign direct investment as a source of funding. Although the cost of FDI in British NGOs is expected to escalate due to Brexit, this recommendation can help British NGOs overcome the funding challenges posed by the country’s withdrawal from the European Union (Somai, 2016). Although this project has contributed to the existing knowledge about Brexit and its impact on humanitarian organisations in the UK, it is associated with certain limitations. For example, the empirical findings are based exclusively on individual perceptions and attitudes, which may be biased and subjective in nature (Daniel and Sam, 2011). In addition, the sample of this project was drawn only from 43 participants, which poses a serious threat to the validity and reliability of the produced outcomes (Saunders et al., 2015). Finally, the employees of only four British NGOs were included in the sample, which can limit the extent to which this sample is representative of the whole population of NGO employees in the UK (Chawla and Sodhi, 2011). Adler-Nissen, R., Galpin, C. and Rosamond, B. (2017) “Performing Brexit: How a post-Brexit world is imagined outside of the UK”, The British Journal of Politics and International Relations, 19 (3), pp. 574-591. Armstrong, K. (2017) Brexit time, Cambridge: Cambridge University Press. Bee, C. (2017) Active Citizenship in Europe: Practices and Demands in the EU, Italy, Turkey and the UK, New York: Springer. Bryman, A. and Cramar, D. (2011) Quantitative data analysis with IBM SPSS 17, 18 and 19, Hove: Routledge. Bullock, S. (2017) “As a British EU negotiator, I can tell you that Brexit is going to be far worse than anyone could have guessed”, [online] Available at: http://www.independent.co.uk/voices/brexit-eu-negotiator-europe-euratom-airline-safety-negotiations-theresa-may-worse-anyone-guessed-a7858586.html [Accessed on 4 January 2018]. Chapman, B. (2017) “UK remains top destination for foreign investment but worrying signs gather of Brexit impact”, [online] Available at: http://www.independent.co.uk/news/business/news/uk-remains-top-foreign-investment-destination-signs-brexit-impact-grow-ey-steve-varley-a7750031.html [Accessed on 4 January 2018]. Clarke, H., Goodwin, M. and Whiteley, P. (2017) Brexit, Cambridge: Cambridge University Press. Clough, P. and Nutbrown, C. (2012) A Student’s Guide to Methodology, 3rd ed., London: SAGE. Cowburn, A. (2017) “Brexit: Lost access to single market in services could cost UK economy up to £36bn, new report concludes”, [online] Available at: http://www.independent.co.uk/news/uk/politics/brexit-single-market-services-uk-economy-report-36bn-a7747841.html [Accessed on 4 January 2018]. Creswell, J. and Creswell, D. (2017) Research Design: Qualitative, Quantitative, and Mixed Methods Approaches, 5th ed., London: SAGE. Dhingra, S., Ottaviano, G., Sampson, T. and van Reenen, J. (2017) “The impact of Brexit on foreign investment in the UK”, Working Paper, pp. 1-10. Ebell, M. and Warren, J. (2016) “The long-term economic impact of leaving the EU”, National Institute Economic Review, 236 (1), pp. 121-138. ECHO (2017) “About us”, [online] Available at: https://www.echonet.org/core-values-history [Accessed on 4 January 2018]. Edwards, S. (2017) “140 million euros of EU funding a year at risk for UK NGOs after Brexit”, [online] Available at: https://www.devex.com/news/140-million-euros-of-eu-funding-a-year-at-risk-for-uk-ngos-after-brexit-89932 [Accessed on 4 January 2018]. EMI (2017) “The consequences of a British exit from the European Union”, [online] Available at: https://www.aegee.org/wp-content/uploads/EMI_16_PolicyPosition_Brexit_17_VIEW_FINAL.pdf [Accessed on 4 January 2018]. European Commission (2017a) “The future of the EU migration policy”, [online] Available at: http://ec.europa.eu/immigration/who-does-what/more-information/the-future-of-the-eu-migration-policy-general-context-and-new-initiatives_en [Accessed on 4 January 2018]. European Commission (2017b) “Explaining the rules”, [online] Available at: http://ec.europa.eu/immigration/who-does-what/more-information/explaining-the-rules-why-are-there-eu-rules-and-national-rules_en [Accessed on 4 January 2018]. Fabbrini, F. (2017) The Law and Politics of Brexit, Oxford: Oxford University Press. Fahy, N., Hervey, T., Greer, S., Jarman, H., Stuckler, D., Galsworthy, M. and McKee, M. (2017) “How will Brexit affect health and health services in the UK? Evaluating three possible scenarios”, The Lancet, 390 (7), pp. 2110-2118. Gordon, M. (2016) “The UK’s Sovereignty Situation: Brexit, Bewilderment and Beyond”, King’s Law Journal, 27 (3), pp. 333-343. Gray, D. (2017) Doing Research in the Real World, 4th ed., London: SAGE. Henderson, A., Jeffery, C., Lineira, R., Scully, R., Wincott, D. and Jones, R. (2016) “England, Englishness and Brexit”, Political Quarterly, 18 (2), pp. 187-199. Jungblut, M. (2017) “Between sealed borders and welcome culture: Analysing mediated public diplomacy during the European migrant crisis”, Journal of Communication Management, 21 (4), pp. 384-398. Larsen, P. and Brockington, D. (2017) The Anthropology of Conservation NGOs: Rethinking the Boundaries, New York: Springer. MacShane, D. (2016) Brexit: How Britain left Europe, London: I.B.Tauris. Merriam, S. (2015) Qualitative research: A guide to design and implementation, Chichester: John Wiley and Sons. Oliver, C. (2016) Unleashing Demons: The Inside Story of Brexit, London: Hachette UK. Outhwaite, W. (2017) Brexit: Sociological Responses, London: Anthem Press. Owen, D. and Ludlow, D. (2017) British Foreign Policy after Brexit: An Independent Voice, London: Biteback Publishing. Owen, J. (2017) “Implementing Brexit: Immigration”, [online] Available at: https://www.instituteforgovernment.org.uk/sites/default/files/publications/Brexit_immigration_WEB.pdf [Accessed on 4 January 2018]. Parker, B. (2016) “British humanitarian NGOs face multimillion Brexit shortfall”, [online] Available at: https://www.irinnews.org/feature/2016/06/29/update-british-humanitarian-ngos-face-multimillion-brexit-shortfall [Accessed on 4 January 2018]. Parker, O. (2017) “Critical political economy, free movement and Brexit: Beyond the progressive’s dilemma”, The British Journal of Politics and International Relations, 19 (3), pp. 480-497. Portes, J. (2016) “Immigration after Brexit”, National Institute Economic Review, 238 (1), pp. 1-21. Rees, W. (2017) “America, Brexit and the security of Europe”, The British Journal of Politics and International Relations, 19 (3), pp. 559-573. Saunders, M., Lewis, P. and Thornhill, A. (2015) Research methods for business students, 7th ed., London: Prentice Hall. Simionescu, M. (2017) “The influence of Brexit on the foreign direct investment projects and inflows in the United Kingdom”, Working Paper, pp. 1-22. Somai, M. (2016) “Brexit: Reasons and challenges”, Acta Oeconomica, 61 (1), pp. 137-156. Thompson, H. (2017) “Inevitability and contingency: The political economy of Brexit”, The British Journal of Politics and International Relations, 19 (3), pp. 434-449. Tilford, S. (2016) “Britain, immigration and Brexit”, [online] Available at: http://www.cer.eu/sites/default/files/bulletin_105_st_article1.pdf [Accessed on 4 January 2018]. Welfens, P. (2017) An Accidental Brexit: New EU and Transatlantic Economic Perspectives, New York: Springer. Wincott, D., Peterson, J. and Convery, A. (2017) “Introduction: Studying Brexit’s causes and consequences”, The British Journal of Politics and International Relations, 19 (3), pp. 429-443. Wintour, P. (2016) “Brexit would harm efforts to tackle global poverty, UK aid figures warn”, [online] Available at: https://www.theguardian.com/politics/2016/feb/24/brexit-would-harm-efforts-to-tackle-global-poverty-uk-aid-figures-warn [Accessed on 4 January 2018].